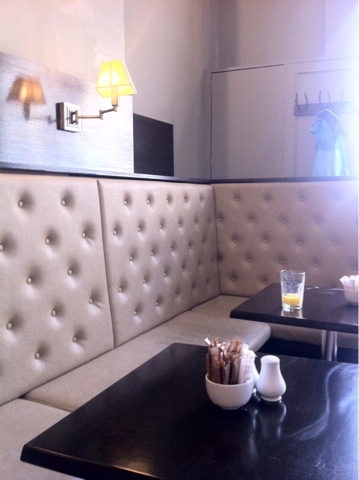 Caroline: Simple but chic are the words which I'd use to describe the environment at Moose Coffee. 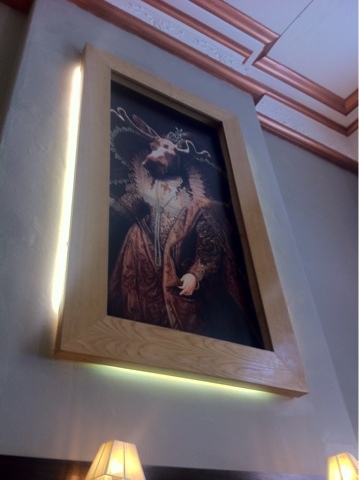 Complete with leather chairs and wooden moose head above the door, this cafe mixes modern and traditional influences (including an old cash register and giant moose Elizabethan portraits) to create a comfortable space, perfect for spending a relaxing afternoon in. Laura: A modern space of simplicity but fused with quirks such as the giant wall hangings and elegant low lit lamps. The neutral colour palette adds to the city chic character of the eatery and really, where else are you going to enjoy pancakes with a supersized picture of an astronaut moose hanging over your head? Caroline: What can I say about the food at Moose - In a word Yummy! The portion sizes here are exceptional and the food quality is brilliant. 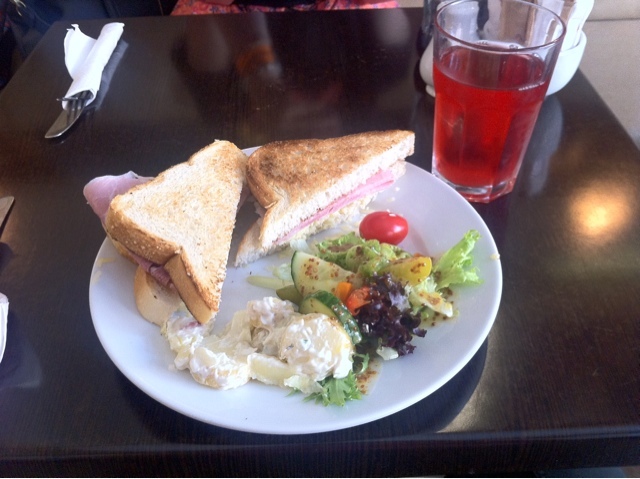 For my lunch I opted for one of their cheese and ham toasted sandwiches and was pleasantly surprised when it arrived complete with potato salad and green leaf garnish (which included a balsamic dressing) - always a much appreciated addition. For dessert I chose their waffles with ice cream which were Ah-Mazing. I've always loved waffles and have them every day when I'm in Belgium, but I've got to say that these we're some of the best waffles I've ever had, so much so that I need to go back to Moose asap to taste them again! Laura: Waffles are my sweet tooth's latest addiction and oh my, did Moose not help to cure me of this problem. 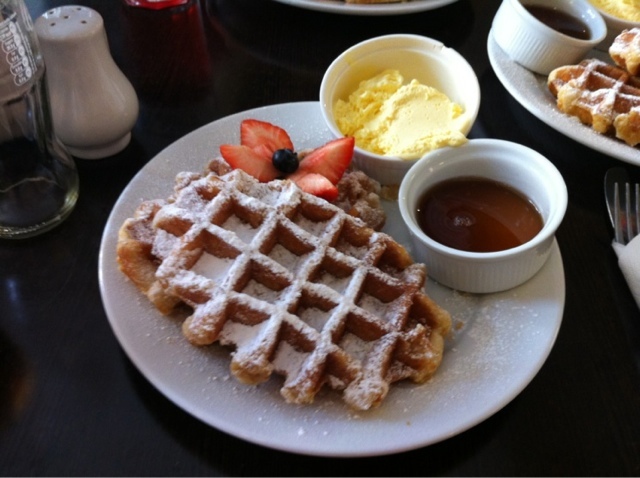 They offer some of the best waffles I have ever had on their particularly American menu. And trust me, I've had a lot. For just over £4 you get 2 large waffles with a side of ice cream and maple syrup to top it off. Simply gorgeous, waffley goodness. Waffles, waffles, waffles ... Oh yeah, did I mention I like waffles? 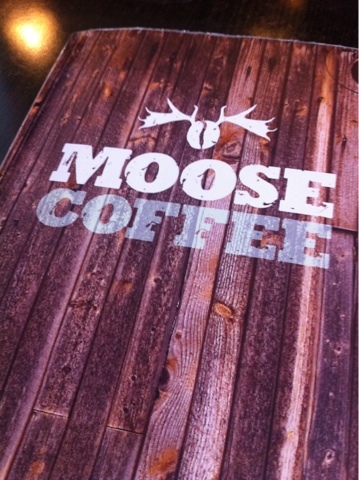 Caroline: The service at Moose was great - no complaints here - excellent! 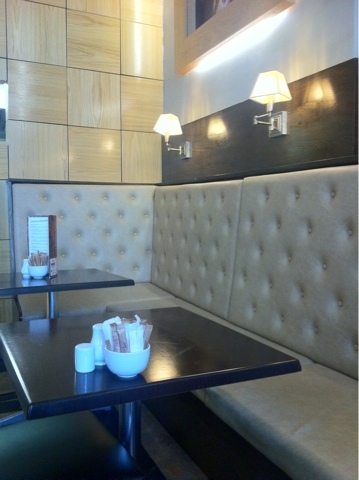 Laura: The staff were extremely polite and friendly. Our food was brought to us promptly and with wonderful presentation. High five! Caroline: As I said before I NEED to go back this place as soon as possible, if not just for the waffles, for the lovely surroundings as well. Someone take me to Liverpool again please? Laura: If this waffle addiction is anything to go by, I've probably already been back to Moose before this review is even published. Cool, sophistocated surroundings and yummy waffles. What more could you want? !